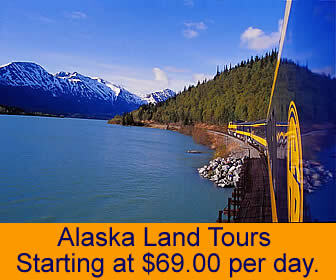 Alaska Railroad Tours and Whistle Stop Excursions that can be included as part of your Alaska Cruises itinerary of pre or post cruise vacations. The Alaska Railroad offers many different train tours include rail excursions to Seward, Whittier, Anchorage, Talkeetna, Denali & Fairbanks. Check out the pre or post cruise vacation packages offered that include Alaska Tour Tours from Seward or Whittier Alaska. While Alaska is a very large state it doesn't offer the typical access levels as most other states do. The one excellent option for visitors not looking to take a fully guided tour is the offers available from the Alaska Railroad. These Alaska train tours can be the perfect way to combine your cruise vacation with an interior trip full of outstanding scenery and very little planning is needed on your part. Everything has already been taken care of by the staff at the Alaska Railroad in the packaged tours that are designed around cruise ship passengers.